I have to thank Professor Roderick Cave* for reintroducing me to Curtis Brett, who had only merited a footnote in my book. Until now I had been completely unaware of Curtis Brett’s key role as the printer to the Jamaican Assembly at a time in the island’s history when the location of its capital was in dispute. The Kingston merchant lobby wanted to relocate the capital there and avoid the hot and dusty ride across the St Catherine plains to Spanish Town to attend to legal matters. The Plantocracy and its lawyers on the other hand wanted to be able to come in from the surrounding countryside to attend the law sessions in Spanish Town and combine this with residence in their town houses, attendance at balls and social functions, and days at the races. Brett, who had been born in Ireland in 1720, had trained as a printer, and although his early ventures in Jamaica were as a storekeeper in Kingston, and then as a plantation overseer, he moved on to work in a counting house in Spanish Town for Archibald Sinclair. It was here that his previous printing experience led to his appointment as printer to the Assembly. In order to raise the start-up capital required it was agreed to invite subscriptions to publish a book of The Laws of Jamaica. Brett finalised the manuscript on board ship, returning to London in June 1755, where the book was printed and bound by his previous master William Strahan. Back in Jamaica he was to be assisted by Charles White, whose work on the Spanish Town Census of 1754 has already been described here. 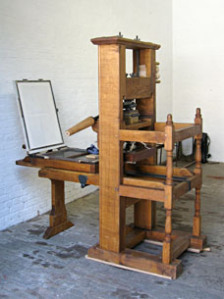 In the spring of the following year Curtis Brett returned to Jamaica with copies of the Laws of Jamaica and all the equipment required to set up as a printer in Spanish Town. By the 8th of May he was ready to produce the first edition of the St Jago Intelligencer, of which sadly only one (or possibly two) issues are known to survive. This very rare book, of which only three copies are known to exist was printed by Curtis Brett in 1757. Details of this copy, for sale by the William Reese Company, can be viewed online here. 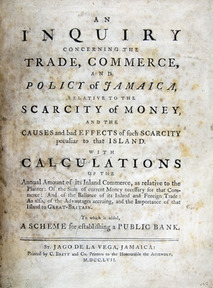 By insisting that subscribers to the Intelligencer paid their subscriptions in advance, and by printing materials for the Assembly and probably a book almanac as well as the book highlighted here, Curtis Brett found his business so successful that by 1761 he had accumulated about £5000 and was looking for fresh challenges. Roderick Cave believes Brett was then bought out by his partner Charles White before setting off to pursue activities as a merchant in Jamaica, New York and London. By this time Curtis Brett was married and the father of a son. His wife was the widowed Ann Allwood, whose first husband was Hayward Gaylard. Hayward Gaylard had a chequered history, he had been a haberdasher and merchant in Cornhill, London but had been declared bankrupt in 1746, and had presumably travelled to Kingston in the hope of mending his fortunes. There was in London at the same time a printer called Doctor Gaylard (c.1699-1749). He was not a medical man, for Doctor was indeed his baptismal name! and although he came from Sherborne in Dorset it is not unreasonable to suggest that he was connected with the family of Hayward Gaylard and hence through the printing connection Curtis Brett may have been introduced to Hayward. Hayward Gaylard married Ann Allwood, in Spanish Town, on the 25th of December 1752. The marriage was to be short lived and apparently without surviving children, for Hayward Gaylard was buried in the North churchyard at Kingston on the 24th of July 1756. It seems possible that when Curtis Brett first travelled to Jamaica it was with Hayward Gaylard, and this would account for how he came to meet his future wife. What is harder to account for is how Ann came to be there in the first place. We know that she had at least two brothers, both of whom had interesting careers. Her brother John was an artisan painter who took an apprentice in St Giles in London in 1765 and spent some time on the Carolinas, painting an altarpiece in Charleston in 1772. Her brother Thomas was apprenticed to Thomas Johnson in Liverpool in 1752 and became a master carver and gilder. In this role he exhibited sculptures and created picture frames for Romney, framed works by George Stubbs and undertook decorative carving work for the Prince of Wales at Carlton House. Whether because the Prince was notorious for not paying his bills or for other reasons, sadly, in 1799 Thomas was declared bankrupt, and family properties in Great Russell Street and Charlotte Street had to be sold. What happened to him after this is unknown, but it seems likely he lived out his life at Barking in Essex, died in 1819 and was buried in the family grave in the Whitefield’s Memorial Church in Tottenham Court Road, London. My reasoning on this is governed by the burial in the same church in a ‘family vault’ of his brother-in-law Curtis Brett in 1784. John Allwood, who died in about 1796, left a wife, seemingly his second, and the only reference to a child was to his son John who had some years previously left for Bombay and had not been heard of since. If she did travel out to Jamaica with her brother Francis, this would have placed Ann firmly within the merchant community in Kingston and in a position to meet both of her husbands. We know of only two children of Ann and Curtis Brett. Charles Richard Brett was born in Kingston on the 4th of September 1761 and he may have been the child mentioned in his father’s letter, quoted by Daniel Livesay, as being sent to England. A second son, Curtis Brett, was born on the 8th of October 1765 and one on-line source suggests he was baptised at Stansted Mountfitchet in Essex on the 11th of November that year, which would imply he was born in England, but I am unable to verify this. The second Curtis Brett signed Articles of Clerkship with John Windus of Tooks Castle Yard on the 19th of November 1781, but I am unclear whether he ever practised law. In due course he inherited all his father’s estate, including mining interests in North Wales, when Curtis Brett senior died in 1784. Four years later he married Anna Maria Johnson and they had a family of four sons and two daughters. Of their children, Charles Curtis became an army veterinary surgeon; Henry Richard was a wine merchant and later Brewer’s Agent whose son Walter spent several years in Belgium before he migrated to Canada where his sons both became taxidermists; George fared less well and in 1851 seems to have been a Watchman at the Great Exhibition in Hyde Park. The third Curtis Brett fell even further and seems to have ended his life in the Camberwell Workhouse, perhaps his previous employment as a grocer and later wine cooper and brewer’s agent had led him to drink. I cannot trace Louisa, but Emily Maria married well to a respected clergyman and her grandaughter Emily Mary Edith Lloyd married the wealthy Charles Bosanquet. It was however a tale with a sad ending. Of their three children Muriel died aged only seven, Sydney died of wounds in the early months of the Great War aged barely twenty and his brother Leslie, who appears not to have served, died aged eighteen in November 1918 perhaps in the Spanish Flu epidemic. Curiously, or perhaps not so curiously given the social set they all moved in, Charles Bosanquet was related to descendants of Robert Cooper Lee whose letters form such a major part of A Parcel of Ribbons. * ‘Two Jamaican Printers’, in Roderick Cave, Printing and the book trade in the West Indies (London: Pindar Press, 1987) pp. 206-218. These Curtis Brett letters are partial transcriptions of the originals, the whereabouts of which are sadly currently unknown.